Living more mindfully isn't easy. So, by focusing in on a few small moments each day, you'll be more likely to follow through and develop mindfulness into a daily practice throughout your life. Cleaning might sound like an odd one, but the repetitive nature of essentially all types of cleaning makes them perfectly suited for mindfulness practice. Whether it's sweeping or mopping the floor, wiping windows or countertops, or washing dishes the time you already use for cleaning can become an ideal opportunity to wake up and experience the greater peace and balance that mindfulness practice allows us to cultivate. Guided Meditation: Click here to listen to the Zen for Everyday Life podcast, guided meditation episode 23: Mindful Cleaning. These are all opportune times to practice mindful walking in daily life. My advice: Pick 2 of these and set up a cue for each. What is a cue? A cue, as I'm referring to it, is something that helps you remember to do something else. A specific example is pairing up walking to your car in the morning with being mindful. Setting this up as a scheduled practice gets you to associate walking to your car with being mindful. Pretty soon, you'll notice yourself walking mindfully more often elsewhere because of the paired association. Another example would be putting a piece of paper that says "Be Mindful" somewhere prominent that you'll pass by every day, like on the back door of your room or office, so that each time you pass by it you're reminded to be mindful. Guided Meditation: Click here to listen to the Zen for Everyday Life podcast, guided meditation episode 21: Mindful Walking / Walking Meditation. You don't need to sit down on a meditation cushion and adopt a specific posture to bring yourself into a meditative state. Being mindful of the breath is as easy as turning your attention to it, no matter what you're doing. Whether you're sitting in a lobby, waiting to be called at the Dr.'s office, sitting in your car at a red light, or taking your lunch break at work you can stop, turn your attention to your breathing, and be mindful for even a few short seconds. Making it a habit to use small moments in your day as opportunities for mindfulness practice, such as the abovementioned, is a great way to bring a little more balance into your daily life. Guided Meditation: Click here to listen to the Zen for Everyday Life podcast, guided meditation episode 7: Going Home. A mindful check-in is a simple practice which involves checking in with your physical body for a few moments. As opposed to noticing your breathing, this practice is about becoming aware of the entire physical body as a whole- aches and pains, fatigue or wakefulness, hot or coldness, specific sensations (including the breath), and anything else that arises. Our body is constantly sending messages to the mind and vice versa, so developing the habit to check in with your body regularly can be infinitely rewarding on so many different levels, both physical and mental. Use the below guided meditation to learn how to scan through the body mindfully, then do a shortened version of the practice for a minute or two at a time a few times a day (you can set a reminder on your smartphone) or whenever you find yourself with a minute to spare. Guided Meditation: Click here to listen to the Zen for Everyday Life podcast, guided meditation episode 25: Mindfulness of Body / Mindfulness Body Scan. Eating is one of the major activities of daily life, so it goes without saying that if you can eat a little more mindfully it can make a noticeable difference in the quality of your day-to-day life. However, many will find eating an entire meal mindfully to be difficult in the beginning (especially with kids!). For that reason, I'm focusing here on simply having a mindful drink of coffee or tea in the morning. The simple act of drinking a cup of tea or coffee slowly and mindfully when you first wake up in the morning is one of my favorite practices and I've found it helps me center and calm myself as well as many meditative practices. Plus, this is something so many already do and enjoy doing (mostly with coffee) that it fits perfectly with the flow of their day. Maybe that's you. If not, I'd suggest at least giving it a try. When was the last time you really listened when someone was talking? I mean drop everything, complete focus, eye contact listening? Most of us will have a hard time remembering the last time we really listened to someone (especially someone we see every day of our life) with our full attention. That's what this point is all about. Mindful communication is different from mindfulness practice in that it's much less meditative than other points on this list (more going on, harder to latch on and concentrate on one point for longer periods), but it's still powerful. To listen mindfully means to listen in a way that you're fully present for the other person, hearing everything they say and paying attention to your own reaction to the other person's words in the form of your thoughts, emotions, and bodily sensations. This is simply the practice of stopping what you're doing and noticing what's going on around you and within the body and mind. It's about being with the entire moment as it is internally and externally (and really, making no distinction between the two as separate things). In some ways, it's an advanced practice which builds on practices such as mindful breathing and the mindful check-in. Keep that in mind and start with some of the earlier practices first if you're new to mindfulness practice, mindful breathing being the major recommendation or walking if you find yourself feeling unable to sit still for even 5 minutes at a time. I call this the practice of "Just Being", which refers to just being with the moment fully and openly, accepting everything that comes equally and letting it be. Guided Meditation: Click here to listen to the Zen for Everyday Life podcast, guided meditation episode 13: Just Being. I separate this as its own point because, like the mindful check-in, you can occasionally focus in on the mind and check-in to see what's going on in a more pointed and specific way. As opposed to allowing things to come to you, you direct your attention to what's going on in your mind right now. This is a useful technique for when you're especially puzzled or confused about something (or a combination of things) and feel like you need to find a resolution quickly. Focusing in on your mental activity and shining the light of mindfulness on it can help bring clarity where there was once fog. Formal meditation practice can do this as well, but we don't always have time to sit for long stretches in formal meditation. This point is about noticing the lack of mindfulness or awareness. Specifically, moments where you space out / zone out or go into autopilot mode (like driving home from work like you've done 1,000 times before). This is only possible by becoming aware of this moment in the first place, so it's more the decision, once having "woken up", to acknowledge when you were mindless. This is very helpful because it helps you to draw a contrast between mindfulness or wakefulness and mindlessness, allowing you to see more clearly that you're practicing correctly. As we go about our day, much of the time we're running on autopilot. However, occasionally, the lights come on and we realize we've been going about the last 2 hours like a drone and have a moment of "waking up" (often a change of scenery like leaving a building compels this change in us). We often end up checking back in to autopilot mode shortly thereafter. However, you can stop this pattern (at least for a little bit at first) by reminding yourself to be mindful during those short moments of waking up and use it as an opportunity to become mindful of what's going on in your body and mind as you go about that moment of your day. When you wake up, notice what you were just doing that sent you into autopilot and also make a note of what took you out of autopilot mode (again, like a change of scenery). As opposed to being mindful of what's going on internally, within the body or mind, noticing as you go is about taking a moment as you go about your day to appreciate whatever is around you in the external world- flowers, trees, the blue sky, any form of natural beauty typically works best- and to be mindful of that for a minute or two. Keep in mind, what you notice doesn't have to be beautiful or appealing. What's important is simply that you notice what's going on around you. Simple things like this might seem like they wouldn't make much of a difference, but when developed into a habitual activity they make a real difference in the quality of your daily life. 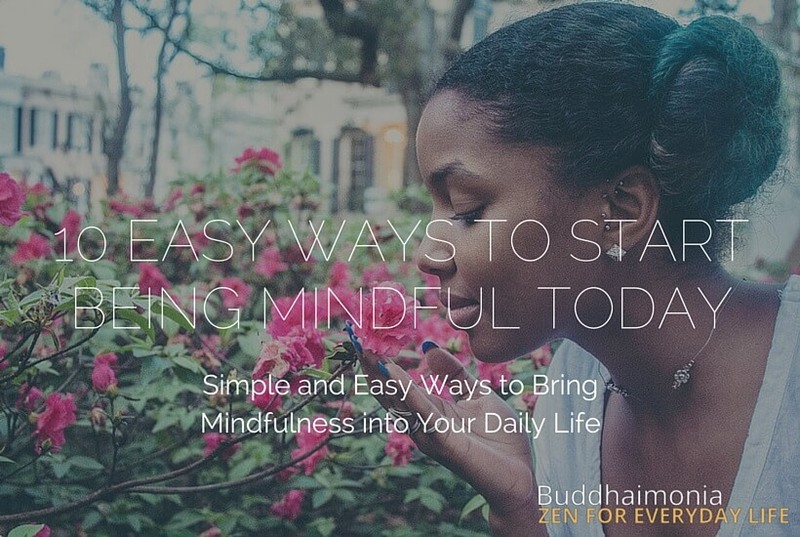 There are so many ways you can start being mindful in your everyday life. However you choose to do so, keep it simple and just go with the 2-3 that really fit your life. By doing it this way, you give yourself the greatest chance of making mindfulness more of a way of life and experiencing the beauty of the practice.